Maver Milton Keynes dominated proceedings in the recent George Barker Winter League fished on the Leicester Arm of The Grand Union Canal between Foxton and Theddingworth. The league, which has been running for nearly fifteen (15) years played host to ten (10) teams of four (4) and was fished over four (4) rounds. Team member Ian Mills provides a round by round account of how the team put together a string of steady performances to win this years title. “We didn’t get the start the team would have liked on the first round finishing fourth, but we all knew it wasn’t going to be easy with the high draw (peg 9). However, we did get two individual results with Tom Boyce getting joint first in section and Wayne Nixon getting a section win and third in the match with 6lb 6oz of roach taken on punch at 10 meters”. “These two results kept us in the running as two of the stronger Browning teams finished below us”. “After the first-round result, we knew we needed to go one better if we were to have any chance of competing for the top spot going in to the last round. Drawing peg 6 we all figured it was an average draw with my own peg (if it fished!) possibly being the best of the bunch. Drawn on the ‘B’ section at Foxton I attacked the peg on two lines with bread and proceeded to put over one hundred (100) fish in the net for 5-9-0 giving me a section win and second in the match“. “With my team mates registering between fourth and sixth in their sections, this surprisingly gave us team second on the day and, with the Browning Central team finishing well down, we went to the top of the league two points clear”. “This round proved to be our best at a time when it was needed most. With only two points separating ourselves and the second place team we knew the result would either make for a close finish on the fourth and final round, or we could ease the pressure and stretch our lead at the top”. “Drawing peg 2 put Tom Boyce on a good peg in ‘A’ section at Foxton and Gareth Payne on another good peg at ‘The Stables’. “Wayne Nixon drew ‘B’ section at Foxton which was always going to difficult and I drew the ‘Honey Pot Lane’ section which can also be a bit of a struggle”. “As expected Tom came back with 8-9-0 for second in the section and second in the match and Gareth put 5-0-8 on the scales for a section win and third in the match” My section third and Wayne’s section seventh was enough for a team first on the day and gave us the extra point lead at the top of the league”. “With the results the way they were the league had become a two horse race with a three (3) point difference between Maver MK and Browning Central”. 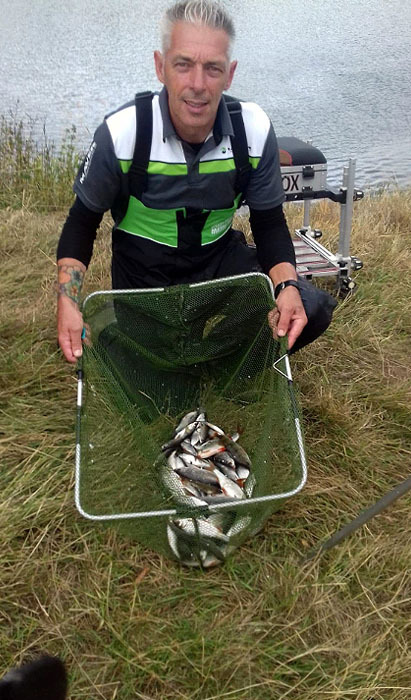 “Favouring a low draw we were all smiles when I put the team on peg 3. With Central drawing peg one the plan was simple, get as close to them as possible so fewer teams could get in between”. “With Wayne on the low numbers in the favoured ‘A’ section at Foxton and myself at ‘The Stables’ we were quietly confident of doing what was needed. True to form the Foxton section produced and Wayne did exceptionally well to win the section and the match with 6-6-0. In my section the spoils went to Browning Central as expected with 2-8-0 followed by myself taking second place with 2-0-8”. “After a few phone calls to Gareth and Tom I was pleased to be informed that they were both a single place behind the Central anglers which in turn meant that no other teams could get in between to create an upset”. “On the day we finished third and with Central finishing in second place it soon became clear Maver Milton Keynes had won the league”. “Although the points at the end show it to be quite close, it was in fact a very dominant performance from the team. Five frames and five section wins and a team first, second, third and fourth across the league and myself taking third place in the individual league”. “A fantastic result for Maver Milton Keynes”.